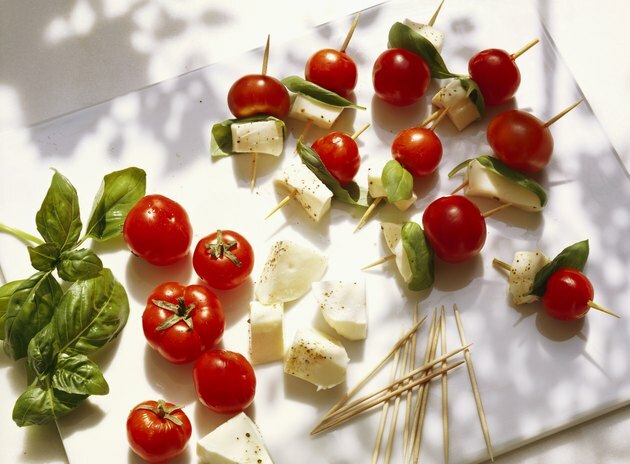 Whether you prefer a classic tomato and basil salad with fresh mozzarella, or simply a good string cheese, mozzarella is a beloved Italian delight. It makes the perfect melted topping for pizzas and lasagnas. Unfortunately, full-fat mozzarella cheese can really pack on the calories. You can decrease your intake of saturated fats by trying some lower-fat alternatives that have the taste and texture you love, with some added nutritional benefits. Mozzarella cheese can be made with whole milk, skim milk or something in between. There are definitely nutritional bonuses to be gained from choosing a lower-fat cheese. In 100 grams, whole-milk mozzarella provides 300 calories, 13 grams of saturated fat and 79 milligrams of cholesterol. Switching to nonfat mozzarella will save you 60 milligrams of cholesterol and half the calories. Nonfat mozzarella also packs in an extra 10 grams of protein and almost double the calcium. It may take some getting used to, but it's worth at least trying part-skim to see how you like it. Believe it or not, tofu can serve as a flavorful cheese substitute in Italian lasagna and spaghetti meat sauce. Experiment with tofu in the kitchen to save yourself lots of calories and fat, while still getting in some calcium. Firm tofu prepared with calcium has only 70 calories in a 100-gram serving. That is less than one-third of the calories in whole-milk mozzarella. Combining tofu with mozzarella in mixed dishes can make negligible differences in taste for huge differences in nutrition. You may think the best way to reduce your fat intake is to replace full-fat mozzarella for other full-fat cheeses. However, mozzarella is relatively high in moisture and tends to be lower in fat overall. Both regular cheddar cheese and provolone are higher in calories. Feta cheese saves you about 35 calories for 100 grams, but it has more cholesterol and saturated fat. Feta cheese is also very high in sodium. When it comes to cheese, moderation is key. Your best bet is to opt for lower-fat mozzarella rather than switching to different types of cheese. Decreasing the fat content in your favorite dishes may turn you off to the taste initially. Fat is an acquired taste and texture, but once you get used to lower-fat meals, old recipes will start to taste too rich. The fat in cheese is mainly saturated, meaning it is unhealthy for your heart. Reducing fat content usually brings down calories and can serve as a weight-loss strategy as well.